Robert M. Bernstein, MD, MBA, FAAD, a Clinical Professor of Dermatology at Columbia University in New York and a pioneer of modern hair transplant procedures, is honored to be included in New York Magazine’s annual ‘Best Doctors’ issue for the fifteenth consecutive year. Dr. Bernstein’s two decades of innovation in surgical hair restoration and dedication to his patients at Bernstein Medical – Center for Hair Restoration have earned him placement in the 2014 edition of the peer-nominated ‘Best Doctors’ issue. The respect his colleagues have for his work stems from his leadership and dedication to advancing and improving surgical hair restoration procedures. Dr. Bernstein’s latest work is in developing new applications for robotic hair transplant procedures. In addition to being among the first in the world to incorporate the ARTAS® robotic system into his practice, Dr. Bernstein was the first to describe Follicular Unit Transplantation (FUT) and Follicular Unit Extraction (FUE) into the catalog of medical literature. He has authored over 60 publications in scientific journals. These writings have fundamentally transformed the hair transplant procedure from older “plug procedures,” into a modern technique that uses precise robotic technology to extract individual follicular units from the back of the scalp. New York Magazine’s ‘Best Doctors’ issue is a special annual edition of the acclaimed magazine which contains a directory of the New York area’s best physicians selected by Castle Connolly, Ltd. Physicians throughout New York, New Jersey and Connecticut are nominated by their peers as part of their survey and must also pass a rigorous physician-led review of the doctor’s qualifications, reputation, skill in diagnosis and treating patients. Dr. Robert M. Bernstein’s published articles on Follicular Unit Transplantation have been called “Bibles” on that methodology. He has received the Platinum Follicle Award, the highest honor in the field, and has been named the Surgeon of the Month and Pioneer of the Month by the International Society of Hair Restoration Surgery (ISHRS). Dr. Bernstein has appeared as an expert hair loss physician on many notable television programs and in many news and lifestyle publications over the years. Examples include: The Oprah Winfrey Show, The Dr. Oz Show, The Today Show, Good Morning America, ABC News, CBS News, New York Times, Wall Street Journal, Men’s Health Magazine, and more. He is also co-author of Hair Loss & Replacement for Dummies. Dr. Bernstein graduated with honors from Tulane University, received the degree of Doctor of Medicine at the University of Medicine and Dentistry of NJ, and did his training in Dermatology at the Albert Einstein College of Medicine. Dr. Bernstein also holds an M.B.A. from Columbia University. Bernstein Medical – Center for Hair Restoration, the facility Dr. Bernstein founded in 2005, is dedicated to the diagnosis and treatment of hair loss in men and women using the most advanced technologies. The state-of-the-art facility is located in midtown Manhattan, New York City and treats patients from around the world. 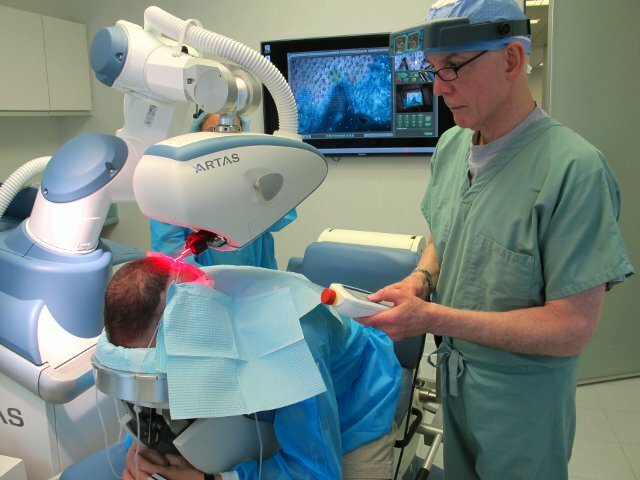 In 2011, Bernstein Medical became one of the first practices in the world to offer Robotic FUE procedures using the image-guided, computer-driven technology of the ARTAS Robotic System. Bernstein Medical is a beta-testing site of the robot’s new capability including the creation of recipient sites. The board-certified physicians and highly-trained clinical assistants at Bernstein Medical take pride in providing the highest level of treatment and care for all patients.